How might we shift the power of research investment to people and communities? 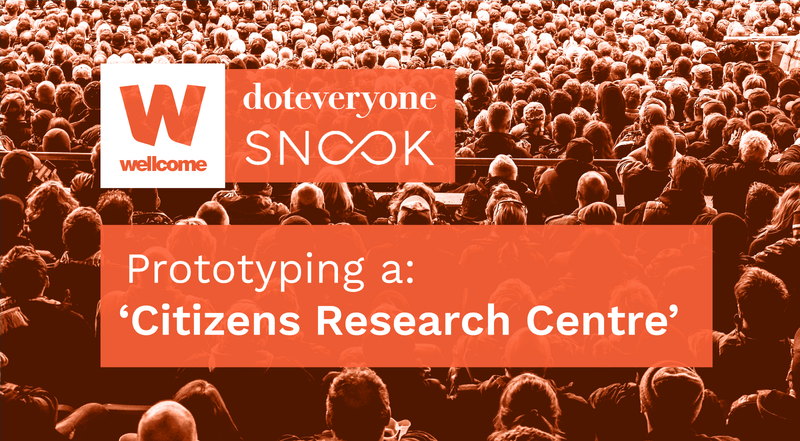 Sarah Drummond, co-founder and Managing Director of Snook, the design agency helping organisations produce great services by putting people first, introduces the Citizens Research Centre. This is the first of two ideas to come out of the work Doteveryone and Snook did in partnership with the Wellcome Trust’s Public Engagement team to explore different ways they could deliver on their strategic aims. This project was led by senior researcher Lucy Stewart from Snook and Cassie Robinson Strategic Design Director of Doteveryone, now Big Lottery. We’ll introduce the second idea, Charity As Platform, in a subsequent post. Meet Sharon, she is the mother of Zak who was diagnosed with chronic fatigue at an early stage. Sharon is the expert in her son’s health condition and has spent huge amounts of time undertaking research, meeting with experts and discussing the condition online in communities. In her experience, chronic fatigue has been poorly misunderstood by people, whether that is her son’s employers or even a relative, just wanting him to ‘pull himself together’. And in the medical context, she’s found it to be poorly misunderstood by doctors. She finds herself in a position of having to teach hospital professionals how to treat her son. Sharon calls this a ‘vacuum of understanding’ and when this exists, you end up on your own quest to understand the problem, interrogating everything from coping mechanisms to the science of what is really happening at the level of cells, body and mind. She and many others are an untapped resource. Their research and knowledge could be used better to treat conditions. Additionally, they often see the gaps in relationships between the specialisms. In a complex health system, this knowledge could be captured to better inform funded research, given they often act as brokers. Looking into formal research, often undertaken by an underfunded researcher she’s tracked on the internet, she’ll find interesting insights that fill gaps in her knowledge. Engaging with the communities she has found consistently that herself, and the communities she networks with, on young people around the condition are building their own research and campaigning for research to be invested in. However commissioned research isn’t reaching them or being invested in relation to their needs. We asked Sharon what might happen one day if she won the lottery? Fund research she’d say, the kind she really needs. She speculates then, what if we could collectively fund researchers to undertake research where a community feels there is a need or gap in knowledge? So we asked ourselves the question: what does a collective efficacy approach look like when you put the groups together to solve this problem? Can we build a Citizens Research Centre? Currently, models of patient participation in health research involve multiple intermediaries. Power sits in the hands of institutions and public participation takes a long time (if ever) to influence change. More people empowered to access, use, respond to and create health research and innovation, more people-centred health research, and society to value Wellcome’s work. So together, we built a concept that would align with these ambitions and support the needs emerging from our research with people like Sharon. What we developed is not a finished ‘solution’ but a concept with ‘form’a around it that allows us to ask more questions about how it would work. When thinking about new ‘platforms’ (platform not only in a pure digital sense but as in a community of people working together) it’s important to consider and see if this behaviour exists somewhere else already. That is not to say that you can’t stimulate an innovation in behaviour with a new service or platform. But from a design perspective, it makes it easier to introduce a new concept that might provide value for these communities in a new way if they already behave in a certain way. And we found examples of where communities are collaborating around symptoms, contributing to research and sometimes paying from their own pocket for additional research to be undertaken by health professionals and researchers. From this, we created the working idea of ‘The Citizen Research Centre’ (CRC). The CRC is an open, community-led platform that places funding directly into the hands of patient groups so they can allocate funds to recipients they believe are best placed to take research in the direction of their choosing. The Centre directly challenges the role of experts in determining the priorities and trajectory of biomedical research. At a macro level, it supports individuals to come together as communities and reach a consensus on what areas of investigation they believe are important or a priority. Then, a funder (like Wellcome or others) could review and evaluate the community need. Ensure Wellcome is making a statement about where they believe power can lie. From our high-level testing with people within the research and charity sectors, the concept seemed to fly. It appeared to meet the user needs of those seeking to surface research about conditions. It will need a more thorough enquiry into ‘who owns this’, however, we do know that platforms like this could be incredibly helpful to people like Sharon, and the communities she works with, to develop research on what helps her son live well. This is a speculative prototype and really, would be a governance design over and above a digital platform. It will need further testing to work out how it would work in practice and things such as accountability, power dynamics and the power of the crowd. Where does power sit and what are the new governance models that are needed to support this idea? How might we protect self-organised communities so they’re not influenced by big players and remain autonomous to make decisions and truly own the allocation of funding? How do we ensure the research, once funded, is heard and practiced? How might we support health systems to read the science and the research produced through this model earlier in order to change practice? How do these communities influence this adoption and how do we know it’s working?